Sometimes life suddenly changes direction. A spinal cord injury on June 13, 1998 caught me by surprise during a bicycle ride when a 3-ton tree came crashing down on me. My husband, Mark Leder, and I built our dream home in 1995. We expected to live there for an unlimited time, but it has become more of a nightmare; of stairs that I can’t climb, cabinets beyond reach, and bathtubs that I can’t enter without assistance. Since my injury, we have been planning to build a home that would better accommodate both of us. I had seen a magazine article on Universal Design (UD) — a framework for the design of places benefiting the widest possible range of people in the widest range of situations without special or separate design. Encouraged by the concept, I devoted my time to research, including trips to the library, Internet searches, speaking with others who used wheelchairs, and a visit with our independent living center (ILC) director. We visited homes built by wheelchairs users and took extensive notes on what features limited accessibility for the owners and which features worked well. After months of information collection, Mark began to sketch out a floor plan for our new house. The process began with choosing a location. We drove around the section of town where we wanted to live and found a new subdivision. Two builders had several lots available. Each builder had only one ranch-style floor plan to offer. We became discouraged; these homes did not meet our needs. Based on referrals, we decided on C.V. Perry to be our builder, who told us we could modify his existing floor plan by erasing all interior walls and redrawing a new floor plan within the original house footprint. So we put a deposit on a lot. Mark and I quickly became overwhelmed with the design process, so began our search for an architect. We contacted the ILC and Bureau of Vocational Rehabilitation for architect recommendations. Our builder also recommended an architect who, when asked, “How would you approach the design of the kitchen for our universal design home?” answered, “I would let the cabinet company lay out the floor plan.” He clearly had no experience with Universal Design, and simply wanted to delegate the whole task. A second recommended architect sent me his resume and summary of completed projects. I asked for his references and called three of them. One of them, a woman who had hired him to remodel her bathroom, said that she was still not able to reach any of the electrical outlets. A third architect was located out of state, making face to face conferences too difficult and costly. We interviewed a woman who had designed her home using UD features, but she was not an architect. Our project needed a registered architect to officially “stamp” their seal on any final plans. A colleague recommended architect Patrick Manley to me. Manley came to our home with his construction manager, Cathy Van Volkenburg. He brought us his reference list and described previous projects where he worked on ADA-compliant housing projects, as well as residential Universal Design. I called his three references and got glowing reviews. We had our man! Over the next few months, we held meetings with Manley and realized we were spinning our wheels trying to “shoehorn” our space needs into the builder’s existing footprint. The only logical solution would be to start from scratch. The house was designed from the inside out. First we positioned rooms in relation to each other. Then we sized each room based on our furniture placement and pathways of travel, allowing for my wheelchair, and keeping square footage to a minimum. We considered “point of use” when locating appliances. Finally, the exterior shell of the home was detailed. We avoided space wasters like a too large foyer. I needed help comprehending the architectural symbols on the blueprints, where I saw I saw several red circles, and asked Manley what they represented. "Those are five foot diameter turning dimensions for your wheelchair," he responded. At times it was difficult for me to envision the layout of rooms. Symbols for the kitchen appliances had to be explained. When I needed more explanation, Manley would draw a sketch of the elevation. We constantly reviewed my need for access to storage areas and work surfaces — especially in the critical kitchen and bathroom areas. To give these rooms expert consideration, we hired kitchen and bath universal design specialist, Mary Jo Peterson. The completed floor plans will be soon be handed over to the builder for construction. Our home will serve as a national demonstration Universal Design Living Laboratory to bring about awareness of Universal Design to the building industry and the public. 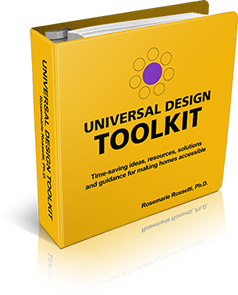 Rosemarie Rossetti, Ph.D. is an internationally known speaker, trainer, consultant, and writer. 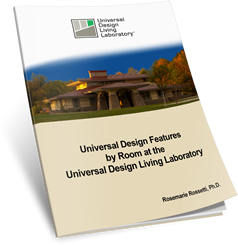 Rossetti is building the Universal Design Living Laboratory, in metropolitan Columbus, Ohio. She can be reached at 614.471.6100, or [email protected]. Visit www.UDLL.com for more information.